Lets look at your first chords on the guitar, below are 3 easy one-finger chords to get you started on the guitar. You can play all of these chords with your first finger on your playing hand. Be sure on the C chord that you arch your finger in order to clear the first string. Once you have a good handle on the basic one-finger chords you can try these basic open major chords. 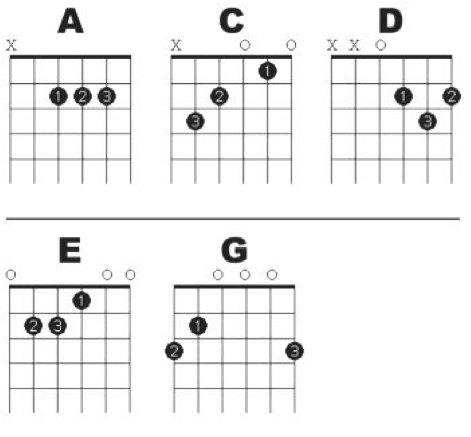 These chords can be found in many famous songs and are a great place to start in playing chords. The numbers in the black dots refer to the finger on your fretting hand that you should use. Once you have mastered these basic chords you will want to try open minor chords and then barre chords.